The 24th Carpet and Art Oasis international exhibition is underway in Dubai, United Arab Emirates. Among the participants are Azerbaijan, Iran, India, China, Turkey, Pakistan, etc, Azertag reported. "Carpet oasis" is considered to be one of the most colorful and attractive events of the Dubai Shopping Festival. Only 300 exquisite handmade carpets were created specifically to be presented for the first time on Carpet and Art Oasis. The scale of the carpet exhibition is increasing annually. More than a million people have already visited the event. This year the Carpet Oasis occupies more than 6,000 square meters, and the number of exhibitors has increased by 20 percent. Different countries are taking part in the 24th edition of the exhibition including Turkmenistan which participates for the first time, along with 15 local companies. 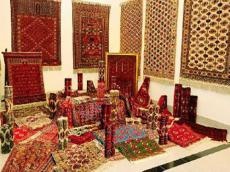 Turkmen carpet weavers brought their best products to Dubai, more than 200 square meters of magnificent handmade cloths in total. Notably, the exhibition will last until February 14. The Land of Fire has seven carpet producing regions including Baku, Shirvan, Guba, Tabriz, Karabakh, Ganja and Gazakh and each of them had its own technology, typical patterns and colors. In 2010, the Azerbaijani carpet was proclaimed a Masterpiece of Intangible Heritage by UNESCO.